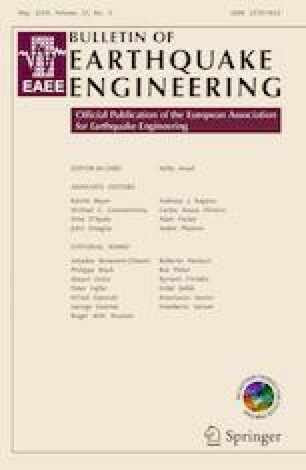 This paper focuses on the evaluation of intensity dependent site amplification factors for Vrancea intermediate-depth earthquakes to be used in the seismic hazard assessment of Romania in the light of the future revision of Eurocode 8. The site conditions for more than 120 sites in Romania are evaluated using as parameter the fundamental site period T0 obtained using horizontal-to-vertical spectral ratio. Next, the period- and intensity-dependent site amplification factors to be used for design purposes are derived based on ground motion recordings from Vrancea intermediate-depth earthquakes and considering the nonlinear soil effects, as well. The results show considerable differences, especially for site class D sites when compared with the values proposed for crustal earthquakes. The original version of this article was revised: Co-author name typo-name to be read as “Kyriazis Pitilakis” instead of “Kyriazis Pitiliakis”. A correction to this article is available online at https://doi.org/10.1007/s10518-019-00567-7. The authors deeply acknowledge the valuable constructive comments and suggestions from two anonymous reviewers that considerably improved the quality of the original manuscript.